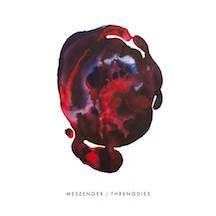 Review: "Messenger: Threnodies" - Sea of Tranquility - The Web Destination for Progressive Music! 2014's Illusory Blues signaled the arrival of UK progressive/psych act Messenger, and the band now find themselves on InsideOut Records for their sophomore release Threnodies. Comprised of Khaled Lowe (Guitars/Vocals), Barnaby Maddick (Guitars/Vocals), Jaime Gomez Arellano (Drums/Percussion), Dan Knight (Guitars/Keyboards), and James Leach (Bass), Messenger are one of the more unique bands you will hear, their style very hard to fit into any one genre or category, but certainly containing elements of prog, psych, hard rock, doom, and classic rock. Opening up with the lush sounds of "Calyx", Messenger opt for cascades of dense guitar textures and melodic vocals, a song that will instantly appeal to fans of Anathema, but then doom laden riffing appears on "Oracles of War", a heavier number that drifts between lumbering, moody metal and dreamy, almost bluesy psychedelia. Lilting guitar chords, organ, and soaring vocals drive the emotional "Balearic Blue", while "Celestial Spheres" fluctuates between spacey Pink Floyd styled atmosphere and the more frenetic workouts of Yes, complete with some fiery guitar, organ, and bass passages. That rumbling bass again boils under the surface of the intoxicating "Nocturne", as layers of melodic vocals and guitar lines sweep the listener away into a trance-like state. Perhaps the tune that dives the most into straight prog is the lengthy "Pareidolia", a mix of Pink Floyd/Porcupine Tree influenced space rock with some sensational guitar work, and the album closer "Crown of Ashes" offers a more tranquil arrangement, easily the weakest tune here and ending things on a sedate note. Plenty of strong material here on Threnodies, which overall is a pretty solid affair, though it feels like they took less chances this time around as compared to their debut. I miss some of the variety that other instruments like flute and violin brought to the debut, as this one is much more guitar based, but the amount of textures and colors here cannot be denied. Threnodies is good stuff for sure, and very easy to recommend. Messenger is a young band hailing from the United Kingdom. They formed in 2012 and released their debut album Illusory Blues in 2014. Their new album is titled Threnodies and this is the first I have heard the band's music. Making up the band are Khaled Lowe (guitars, vocals), Barnaby Maddick (guitars, vocals), Jaime Gomez Arellano (drums, percussion), Dan Knight (guitars, keyboards) and James Leach (bass). The following is a description from the band's website: "Tonally, they dwell equally in the earthly realm of folk music and in the celestial void of progressive psychedelia." Now I don't hear muck folk in their music but I certainly hear a general progginess in their brand of psychedelic tinged atmospheric rock. Sometimes heavy, sometimes soft but always incredibly riveting and ultimately satisfying. The album is composed of eight tracks, the first being "Calyx", a Radiohead influenced number filled with moody soundscapes drenched with atmospheric guitar and keyboards. The music does get heavier before turning back to moody atmospherics and psychedelic underpinnings. The second track "Oracles Of War" takes on a doomier, heavier approach with slow plodding riffs and more energetic rhythms. Both tracks feature excellent lead vocals. The tricky bass line in "Balearic Blue" is another highlight as is the Floyd-like dreaminess of "Nocturne" where the soprano style vocals are superb. The retro flavoured "Pareidolia" is another great track, this time recalling latter day Pain Of Salvation. When the music turns into dreamier territory the Floyd vibe again creeps in, especially in the Waters-like vocals and the slow guitar strums. The first time I played this album I liked it but wasn't blown away. I have been spinning this a lot lately and its getting better and better every time. It's both catchy and absorbing showcasing imaginative arrangements and great all around grooves. Another winner courtesy of InsideOut Music.